This Policy informs you how we collect, use and share the personally identifiable information we obtain from and about you. This Policy applies only to information collected on our Sites and not to information collected offline. We are not responsible for the content or privacy practices on any web site not operated by PMO to which our Sites link or that links to our Sites. Our Sites are not directed to children under the age of 13 and children under the age of 13 should not use any of our Sites. PMO also does not knowingly collect or maintain information collected online from children under the age of 13. Personally Identifiable Information. Depending on the nature of the Site, PMO collects personally identifiable information including, but not limited to, your name, email address, mailing address, and telephone number when you voluntarily submit this information to us in order to participate in activities like blog comments, product reviews, online forums/communities, email newsletter subscriptions, or because you want us to provide you with products, services or information. In addition, we may also ask you for your country of residence and age so we can comply with applicable laws and regulations. We may also collect your credit card information when you purchase products, tickets or subscriptions on one of our Sites, but this information is only used to fulfill your purchase. Web beacons assist in delivering cookies and help us determine whether a web page on one of our Sites has been viewed and, if so, how many times. For example, any electronic image on our Sites, such as an ad banner, can function as a web beacon. We may use third-party technology to help tailor site content to users, to serve ads on our behalf, or to monitor general site usage. These companies may employ cookies and web beacons to measure effectiveness (such as which web pages are visited or what products are purchased and in what amount). Any information that these third parties collect via cookies and web beacons is not linked to any personal information collected by us. Log Files. As with most sites, we automatically recognize and log the Internet URL from which you access our Sites. We may also log your Internet protocol address or “IP address” (which may indicate the general location of your computer on the Internet), Internet service provider, and date/time stamp. Log files are used primarily for system administration and troubleshooting purposes. Order Fulfillment. We use your personal information to process your request for products, services or information and to provide you with customer service regarding your request. Reviews / Comments / Communities. Some elements of your personal information may be displayed to others when you voluntarily participate in any of the community aspects of our Sites. Your name, avatar, IP address and comments may be displayed when you publically review a product or post a comment on one of our Sites. Additional information may be displayed to people when you voluntarily join one of our online communities. Content / Layout / Design. We may internally use your personal information to improve the content, layout and design of our Sites and marketing efforts, and to determine general trends from visitors to our Sites. Communications. We may use your personal information to communicate with you about your request for products, service or information, when you purchase a product, ticket or subscription from us, or when you become a member of one of our Sites. These one-time “transactional” emails are a necessary part of our fulfilling your request or order so you cannot opt-out of these. We may also use your email address to send you content-based email newsletters or communications regarding products and services for sale; however, you will have the option of opting out of these types of communications. You may also globally opt-out of any future email communication from PMO. Please see the Opt-Out and Correction section for additional information. We sometimes need to use third-party companies to perform specific business-related functions on our behalf. For example, we partner with third parties (such as the U.S. Postal Service, United Parcel Service, and Federal Express) to ship products, ensure delivery, and to obtain feedback, improve the quality of our service, and measure and improve the quality of the service of the third party. In the example of shippers, we provide them some personally identifiable information such as your name, shipping address, email, and phone number. It is possible that we might acquire, merge with or be acquired by another company or that we might dispose of some or all of our assets. If that happens, your personal information may be disclosed to another company, but that disclosure will be subject to this Policy, as in effect at that time. On registration forms for certain products, services, or information, we may indicate that your personal information will be shared with a third-party such as a sponsor or business partner. In these circumstances, the third-party will be clearly identified on the registration page and you may choose not to share that information by not submitting the registration form. Upon your request, we will (a) correct or update your personal information; (b) stop sending emails to your email address; and/or (c) disable your account to prevent any future purchases through that account. 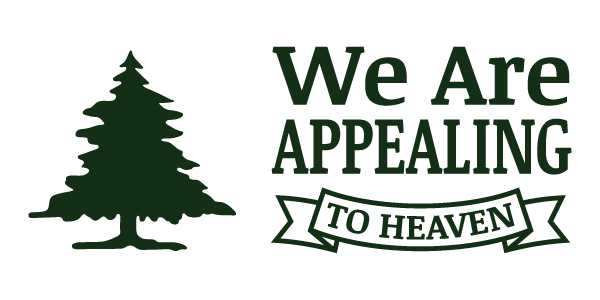 You can make these requests by emailing info@appealingtoheaven.org. Please include your name, street address, email address or phone number to contact you regarding the request, a clear and precise description of the data which you would like to review, modify, or opt-out of, and anything else that will make it easier for us to locate your personal data.